PEOPLE had mixed reactions to a controversial £2m scheme to combat traffic congestion in Headington. Oxfordshire County Council expects to spend seven months installing a new busgate in London Road to speed-up journey times for bus passengers and motorists entering and leaving Oxford. Some residents at the public exhibition said the plans, which also include sprucing-up Headington shopping precinct, could offer a fresh start to the area. However, campaigners have again voiced opposition to the council’s plan to spend £45,000 filling in Headington subway and replacing it with a pedestrian crossing. Derrick Holt, 85, of Fortnam Close, Headington, raised concerns replacing the subway with two crossings could slow the journey times of traffic through the area He said: “The subway was put there to help people cross the road safely and that purpose still remains. Community leader Mick Haines has collected 5,347 signatures against the closure of the landmark, which features murals of Headington. The council will also lay stone-chipped asphalt on the road surface, similar to recent work in Summertown. The work, which starts on April 26, will also see a wider pavement put in and 19 new benches and 16 bins. David Fisher, 37, a freelance photographer who works in London Road, said: “It could help Headington turn over a new leaf. “I was driving through Summertown last week and it is really nicely done. 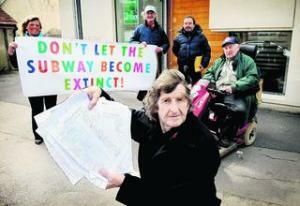 Robert Grimley, 66, of Old High Street, said: “A subway isn’t a particularly attractive environment. Council spokesman Owen Morton said: “As part of the council’s consultation with local people, 58 per cent of 419 people were in favour of removing the subway. “The replacement high-quality pelican crossing will provide everybody with a safe way of getting over the road as many people choose not to use the subway currently. RINGING on doorbells and knocking on doors has become part and parcel of daily life for Mick Haines over the past month. The independent city council candidate has been calling on 100 houses a day, six days a week. Mr Haines is standing for election in Marston for the fifth time, but he said a distrust and dislike of politicians in general had made election campaigning more difficult. Mr Haines has been on the campaign trail for more than four weeks and has spent nearly £400 of his savings on leaflets and posters. 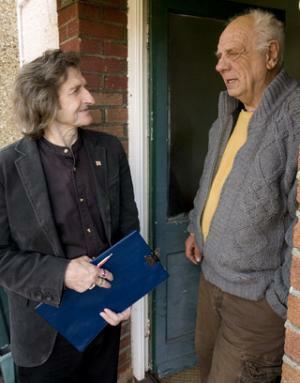 He has had leaflets eaten by dogs and even had to speak to one voter through a cat flap. He said: “I put the leaflets through the door and then I go round and ask them what they think of it. “It’s important to hear their opinions and show that you’re not afraid to meet them face-to-face. Mr Haines was sporting the St George’s flag on a badge, his pen and two rings yesterday. He said he wants what the people want, even if it means missing out on the support of a party. He has lived in Marston for 27 years and calls his community the “forgotten area of the city”. Ron Cooper, 79, of Nicholas Avenue, said he would be voting for community activist Mr Haines, who has previously campaigned against the erection of mobile phone masts near schools. Adam Woodley, 29, Nicholas Avenue, said he would also vote for Mr Haines. He said: “Politicians are all as bad as each other. The only way to go is with an independent who knows the area. Marston shop owner Anthony Baker told Mr Haines: “I don’t know why you do what you do. Mr Haines is competing against four other candidates, including Lord Mayor Mary Clarkson. no matter whether it be man or woman if the truth be told. perhaps legal action against politicians who've left us we know not where. enough to pay the mortgage & have enough to eat. & have no practical benefit before it is too late. So, get yourself behind Mick Haines - that really 'busy bee'. Then you'll see him crush the opposition - just you wait & see !! !